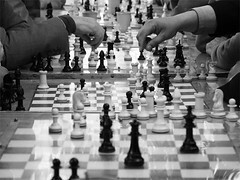 chess, a photo by irodman on Flickr. Most modern politicians are great tacticians but lousy strategists. They spend huge efforts on planning the run-up to the next election, but they don’t often think about the longer-term consequences of their actions (presumably because they don’t expect to be in power for that long anyway). However, the SNP and the wider independence movement are a great exception to the rule. Until very recently, nobody joined the SNP because it was a smart career move, but because they wanted to make Scottish independence happen. I think this explains why most Unionist politicians have been so bewildered by the independence referendum. They assumed from the outset that the SNP wanted a referendum because they thought it’d be a smart tactical move, not because they actually thought it was the right thing to do. The focus on tactics also explains why Unionist politicians so often talk about the short-term costs associated with independence. Of course independence is likely to be a very bad tactical move — within the first couple of years, the costs are very likely to outweigh the benefits. However, as soon as we start looking further ahead, the transitional costs will be dwarfed by the huge financial and social benefits associated with independence. The Unionists keep staring at the immediate costs and don’t understand why people aren’t scared. Meanwhile, the independence movement is full of people with strategic sense who can see why independence makes perfect sense as soon as you take the slightly longer view. It is detail, Cameron and Westminster doesn’t do detail. It is apparent in all the decisions they take and it motivated by a fundamental need to take possession of the 24/7 media. Headlines and photo-opportunities are the lingua franca of their political philosophy. Their overweaning objective, in fact a visceral need, is to get elected to office and when in to get re-elected. Today’s problems are of today and tomorrows will be solved or treated tomorrow. A problem only is important if it becomes an issue with their name on it. Everything is sacrificed to that and it betrays their fundamental flaw; the are high performing sociopaths. I don’t agree all politicians are sociopaths, but many sacrifice their principles in order to move up the political career ladder, and the result is exactly what you describe. I believe that most politicians in the UK at the top, to get to the top, must have elements of sociopathy and I think there is evidence that many CEOs of major corporations in the Anglo Saxon business model are the same. It aids them to get to the top. Tony Blair, Margaret Thatcher, Gordon Brown, Osborne, Duncan-Smith, and maybe less so Cameron. Cameron and Osborne have the excuse that their entire life has been spent in a bubble of privilege, completely isolated from the consequences of their actions. How else can you explain the Bullingdon Club, leaving aside plain hooliganism and that is but the door opener. They are on a magic carpet and are going, in their minds, a hyper inter-galactic speed. They have no idea where to or what they are passing. That is why they have SpAds and Spin Doctors. They don’t read the Press, that is the job of the SpAds to do and the Spin Doctors to control what is contrary to they journey. It is like a Medieval or Roman Court where only the good stuff is told to them. It all becomes a self fulfilling fantasy land. The King doesn’t know he has no clothes because no one will tell him. It is indeed a big problem that many modern politicians are disconnected from their voters. They don’t understand how they live and what they think, and the result is they instead have to govern by opinion poll, which is very unhealthy for democracy. It’s a much bigger problem in Westminster than in most other parliaments I know, though. They are essentially “career ” politicians who, largely, leave University and choose politics as a path to personal riches and social position and not public service.